Support the Arts at UC Irvine! Friends of the Arts is a commitment to the arts at UC Irvine and a pledge to future generations. 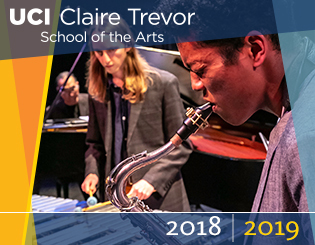 These membership programs offer unique opportunities to become an integral part of the Claire Trevor School of the Arts community. Your investment in the Claire Trevor School of the Arts educates the artists of the future and keeps the arts alive for generations to come. Support us and enjoy exclusive benefits. Contributions over the value of goods and services ($0.00) may be tax-deductible, please consult your tax advisor. Contributions over the value of goods and services ($84.00) may be tax-deductible, please consult your tax advisor. Contributions over the value of goods and services ($126.00) may be tax-deductible, please consult your tax advisor. Contributions over the value of goods and services ($280.00) may be tax-deductible, please consult your tax advisor. Contributions over the value of goods and services ($455.00) may be tax-deductible, please consult your tax advisor. * New Swan Shakespeare Festival not included. Few blackout dates/events apply.